to you. We invite you to join us in the celebration of life and the search for its meaning. Our members form a diverse group with various religious backgrounds. Have you felt a need for a spiritual community that values your whole life, welcoming you as you are and recognizing that every life has extraordinary possibilities? Have you ever wished for a religious community that finds inspiration in all the world’s religious traditions, in nature’s beauty, in poetry, stories, music, and art, and in the discoveries of science? Have you wondered if faith and love could guide spiritual and religious people to work for equity and justice, for peace and freedom, for equal rights for all people in this world, in this lifetime? Have you wanted to be part of a community of love who celebrate each other’s joys, who comfort and support each other in times of trouble, who strengthen and encourage each other for the work of making a better world, and who welcome and celebrate each other’s quest for truth and meaning? For over 30 years the Unitarian Universalist Congregation of the Outer Banks has been building just such a spiritual community. We would love to share it with you. We hope you’ll enjoy exploring this website and our Facebook page, but most of all we would be glad to welcome you to a Sunday service at our Meetinghouse on Kitty Hawk Road. Come as you are! For 500 years, our Transylvanian spiritual ancestors and siblings have followed a Christianity that teaches that Jesus was NOT God. Could there be a revitalizing spirit in their faith for the Christianity of today, which some have turned into an excuse for closed minds and hardened hearts? Annual Flower Communion. Please bring a flower (s) from home to share. We’ll arrange the flowers on a central table for the service, and then redistribute them in a simple ceremony to celebrate the beauty and gifts we all bring to our congregation. Easter Egg Hunt! After the service this Sunday, weather permitting, we’ll encourage our youngest members to search the playground for Easter Eggs. Willing to help? Please contact Rev. David today or Friday! Spring Bulb and Flower Fundraiser – this Sunday is the last day to order! Please be sure to bring your orders and your checks made out to “UUCOB.” This is our only Spring fundraiser and we hope you will all be generous and be rewarded by some beautiful flowers in your gardens. The catalog has something for everyone – even containers to grow delicious and healthy sprouts for your salads. Order for yourself or for gifts. Please see Sherrie after the service or contact her at 261-4648. A few weeks ago, Rev. David’s sermon “The Tracks of Our Tears” was based on Robin DiAngelo’s book White Fragility: Why It’s So Hard for White People to Talk About Racism. 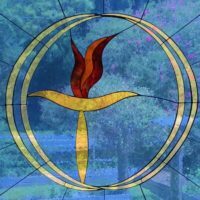 Now UU Forward Together, the North Carolina UU justice ministry, is offering a free three-session (April 28, May 5, and May 12 from 7:30 – 9:00 pm) on-line discussion group reflecting on the book. Please sign up (bit.ly/WhiteFragilityNC2019) as soon as possible if you’re interested. Celebrate with the Coastal Virginia Unitarian Universalists! Our sibling congregation (formerly known as the Unitarian Church of Norfolk) is celebrating their new name and new building next Sunday, April 28th, at 4 PM. With a sermon by Rev. Jeanne Pupke of the Richmond congregation, a video message from UUA President Susan Frederick-Gray, and a combined choir from the Hampton Roads congregations, it should be a grand occasion! It would be great if a group from UUCOB wanted to go join in the celebration. Contact Rev. David for details. Will today be a day for you to notice what it is like to be alive?